Our examination of Abner’s story stopped at the Battle of Gibeon where he had just called for a ghastly match that left all the participating fighters from David’s and Saul’s camps dead. We pick up the story from there. Read and be blessed! After that senseless and gory match, heavy fighting commenced between the two camps and Saul’s men were soundly beaten (2 Samuel 2:17). As we stated in the first part of this teaching, none of this fighting would have occurred if Abner had surrendered the kingdom to David instead of crowning Ish-bosheth over Israel, leaving David with Judah alone (2 Samuel 2:8-11). As the fighting progressed, Asahel, younger brother of Joab (David’s army commander and cousin), got it into his head that he would acquire the bragging rights for killing Abner. The young man was no match for Abner, the seasoned general. Although Abner warned him to desist from pursuing him, he refused to give up the chase until he killed him (2 Samuel 2:18-23). Thus Abner who had begun the day by demanding needless bloodshed for fun became a marked man by the end of the day because Joab was definitely going to seek revenge. “7. And Saul had a concubine, whose name was Rizpah, the daughter of Aiah: and Ish–bosheth said to Abner, Wherefore hast thou gone in unto my father’s concubine? 8. Then was Abner very wroth for the words of Ish–bosheth, and said, Am I a dog’s head, which against Judah do shew kindness this day unto the house of Saul thy father, to his brethren, and to his friends, and have not delivered thee into the hand of David, that thou chargest me to day with a fault concerning this woman? 10. To translate the kingdom from the house of Saul, and to set up the throne of David over Israel and over Judah, from Dan even to Beer–sheba. 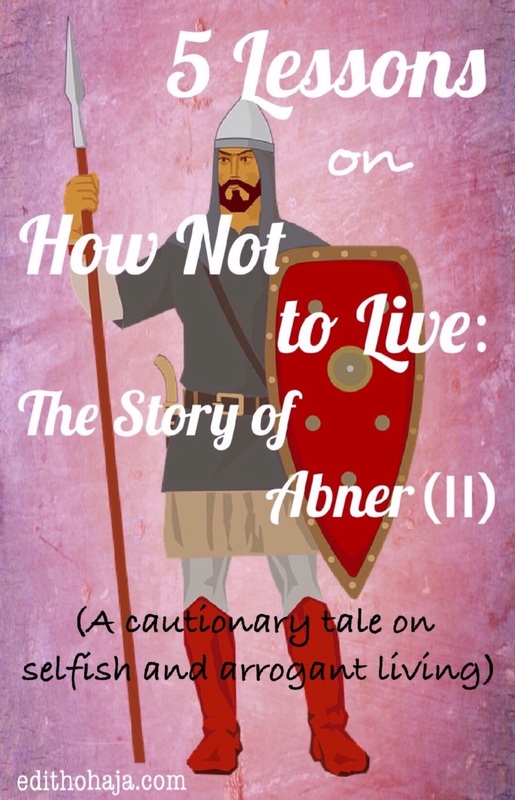 Abner trespassed moral and cultural boundaries in sleeping with Saul’s concubine, who rightly belonged to Ish-bosheth, Saul’s surviving son and the new king. But when a man does not fear God, he develops an arrogance that makes him feel he is untouchable. Abner saw Ish-bosheth as living and ruling by his say-so. He therefore felt he could disrespect and intimidate him. Angered by Ish-bosheth’s query over his misbehaviour, Abner threatened to turn the kingdom over to David. He made good his threat by visiting David at Hebron to discuss the terms for the handover, terms that obviously would see him gain much from the situation. There he met his death at the hand of Joab, in vengeance for Abner’s slaying of Asahel (2 Samuel 3:12-27). Abner really thought it was all up to him to decide who became king and when. However, he was plagued by hubris which sets those who harbour it on the highway to destruction. It seems he finally got his just deserts (Matthew 26:52) although Joab would bear the blame for killing him in peace time as though they were at war. Lesson 1: Do not place yourself above the law, particularly God’s law. Lesson 2: Do not disrespect or mistreat people because they are beholden to you. Lesson 3: Beware of craftiness as it often boomerangs. Lesson 4: Do not arrogate too much influence to yourself. Rather play the roles God gives you the privilege to with humility. Lesson 5: Do not prey on others or you will likely become a prey yourself in due course. It doesn’t really come as a surprise that Abner met his demise at the hands of another violent man, whose relationship with David was just like Abner’s to Saul (Matthew 26:52). Joab may have sought to kill two birds with one stone: avenge his brother’s death and prevent Abner from taking the credit for uniting the kingdom under David. That achievement would have made David to feel indebted to Abner and who knew what he would have demanded as reward in the pact he asked David to make with him in 2 Samuel 3:12? The command of the army, perhaps? Joab couldn’t allow that to happen. We were not created to play God and ride roughshod over others. Each of us needs to make God Lord over our lives by accepting Jesus as our Saviour and living in humble obedience to His word. Our Father in heaven, may we not live like Abner such that our lives become cautionary tales to posterity. May we honour You and live in peace with folks around us, loving, serving and building them up humbly in Jesus’ name. Amen. The scriptures in this post are from the King James Version of the Holy Bible. Hello! I’d love to hear from you. Do share your impressions about this teaching in the comments section below. So glad to hear from you, Rita! I thank God for helping me to complete the study right away. I pray it blesses many people. I pray abundant grace and fruitfulness on your ministry and God's richest blessings on your family in Jesus' name. Yes, beloved! It's a big trap of the devil for one to think so. You're highly blessed in Jesus' name. I'm glad it blessed you, praise God! Hope you have a relaxing and enjoyable time in the approaching weekend. Rightly said, Ma! When a man does not fear God, he can do a lot of evil and feel he's right because he can. Help me, O'Lord, help me to fear and love you ... You're blessed, Ma! Amen and amen. You're blessed too, Daniel! Yes, my dear! The Bible teaches us that God opposes the proud but gives grace to the humble. One with God is majority. I wonder what we can do or achieve without God. Let's seek for his presence and I assure us that every other thing will fall in place. The lessons are all-important and I wrote them down in my diary as a reminder of what my life should be like. Thanks a lot for these lessons. For the wages of sin is death and whosoever live by the sword shall die by the sword. i wonder if Abner thought that with all those killing spree that he hasn't gotten himself enemies(people he killed their loved ones), and that serves as a lesson to many who occupy leadership positions today because whatever decision taken might come back to them in another form(good/bad). Amen to the prayer ma, this is very inspiring and educative teaching, I benefited mostly from lesson one and two, no matter who you think you are, how strong you are, you are not above the law of God and if you claim to be he will make you understand that you are living a borrowed life by treating you the way you deserve.. if you exact your self, God will bring you down but if you humble yourself God will uplift you. what really led to Abner's downfall was his pride. may god help us. pride indeed goes before a fall for " when a man does not fear God, he develops an arrogance that makes him feel he is untouchable'' and this ultimately begins his pathway to destruction. this story has really taught me a lot and drawn my eyes to many things. thank you so much, ma. I think grace in the life of Christians is measured by the level of our zeal for the work of God. we only have to pray for his strength in our services to Him. Like the saying goes, he who leaves by the sword, dies by the sword. May God have mercy on us all. Amen. God is surpreme, he is truly everything. Many lessons learnt from this post. One of which is humility, stay humble, you'll be at peace with many. The fear of the lord keeps us from committing evil. Thanks Ma'am for these lessons. This is an inspiring lesson we should not look down on people because of their present class in life but should treat them as we wish to be treated also we should learn not to play God in the life of others but play the role which God has giving us with so much humility. Be careful of your actions especially when you are placed in a position of authority. Arrogance never pays with good outcome. bless you ma!!!! When people misplace exertion of power to riding others, as supposed to serving in humility, the inevitable case of Abner looms. We should serve with all humility and grace to serve humbly comes only from God. Thank God for your Wisdom. When we are in a higher position we shouldn't treat others wrong rather we should keep them in their shoes and humble our selves. God reward good deeds, I pray that God will help us treat the people we are above equal and also the people above us amen. Humility makes God lift you up, treat all men equal even though you are above them. If God is for you who can be against you? David is the lord's chosen, Saul and Abner despite their persecution couldn't bring him down. These lessons must get into my diary; thank you so much, ma. No one can touch God's anointed, for he is like an eagle soaring high. The story of Abner has indeed taught me great lessons. 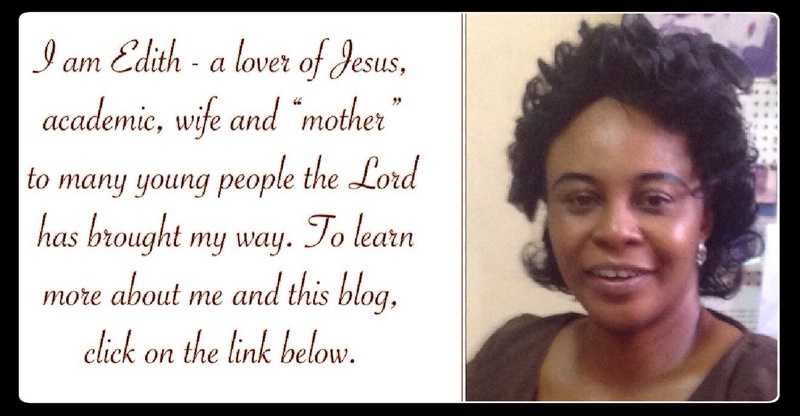 Abundant blessings to you Lady Edith, I am in awe and amazement how God has used you to clarify the story of Abner. I woke up just the other day with the name Abner on my mind after a dream and I was seeking an explanation for who Abner was and the overall story. You have shed light in a multitude of ways. Thank you and thank you again. Thanks, David. My name is Edith by the way. Thank God for His Spirit that illuminates His word for us. You are blessed! Wonderful teaching filled with truth! I pray my heart will be always humble before my Lord, and that I will leave justice in His hands - where it belongs! Thanks for this great post! Thanks for dropping by, my dear sister. I pray the same for myself. God's protection and provision be your portion in Jesus' name. Thanks and stay blessed, my dear sister!